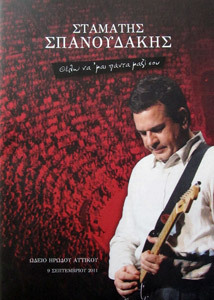 It has been 4 years since the last concert of Stamatis in Greece. In the meantime, he has been composing music in Naxos and his new CD was released in May 2011 "Je veux toujours être avec toi". A series of concerts were held in Greece from 31st of August to the 9th of September 2011 in Thessaloniki, Volos, Kavala, Lamia and Athens. The Athens concert was held at the Herodion Atticus and was completely sold out. (remember her from the soundtrack of the film "Brides?). This concert brought back many memories. Here are a few photos taken by Jürg Frei and myself before and during the concert.